JS Thomas Service, Inc. is among the industry leaders in the Atlanta metro area and all of North Georgia for commercial and industrial HVAC maintenance and repairs. 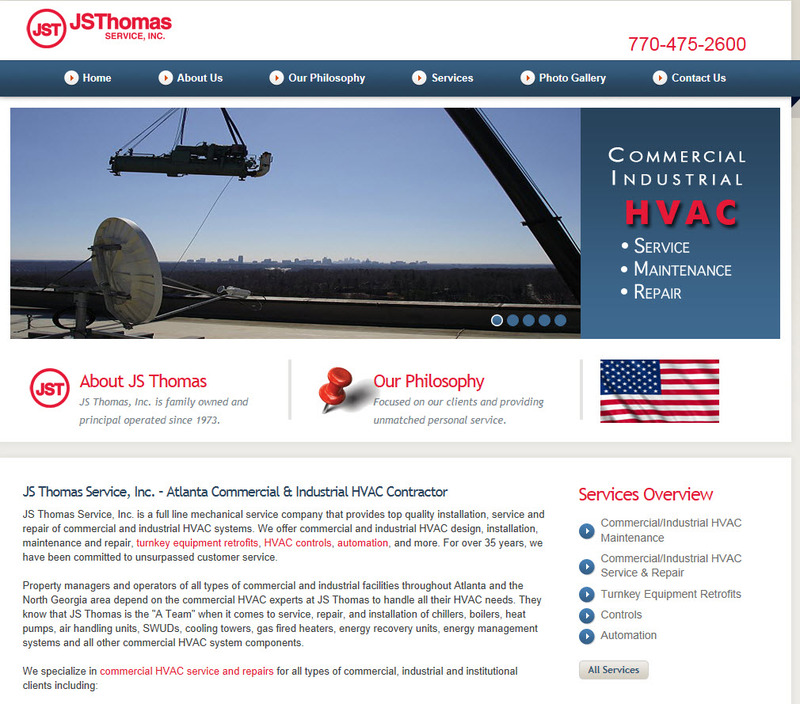 For over 35 years, Atlanta area property managers, business owners and operators of all types of commercial and industrial facilities have relied on the commercial HVAC experts at JS Thomas Service, Inc. for their Atlanta commercial HVAC maintenance needs. At JS Thomas Service, Inc., we understand that downtime is expensive and when an issue arises with your commercial HVAC system, you need a fast response by commercial HVAC systems experts who can get your system up and going again quickly. That’s why we personally answer every phone call to JS Thomas Service, Inc.. When you call us, you will talk directly to an experienced commercial HVAC professional who can solve your heating, cooling, and mechanical systems problems. We don’t have “customer service representatives”, we don’t use call centers, you will never be sent to voice mail, and will never need to wait for a return call. We offer Atlanta area business operators and property managers emergency service 24/7, 365 days a year and make every effort to respond to every emergency call within two hours or less. Every JS Thomas Service, Inc. technician is an experienced, factory trained commercial HVAC professional. Most of our Atlanta commercial HVAC maintenance technicians have more than ten years of commercial and industrial mechanical systems experience and many have been with us for over 20 years. To help avoid HVAC problems before they arise, we offer maintenance programs specifically tailored to the needs of your facility. Our commitment to you is to provide top quality commercial and industrial HVAC maintenance and repairs performed by experienced, professional technicians and backed by our unmatched level of fast, direct, personal service. JS Thomas Service, Inc. provides top quality commercial HVAC services to businesses in Alpharetta, Atlanta, Marietta, Duluth and the surrounding areas.